Wat Pho (Thai: วัดโพธิ์, IPA: [wát pʰoː]), is my favorite among all the temples in Bangkok, Thailand. Wat Pho is also known as the Temple of the Reclining Buddha. The Reclining Buddha's feet is made of mother of Pearls and visitors are not allowed to touch it. Wat Pho is a Buddhist temple in Phra Nakhon district, Bangkok, Thailand. It is located in the Rattanakosin district directly adjacent to the Grand Palace. Wat Pho is named after a monastery in India where Gautama Buddha is believed to have lived. Known also as the Temple of the Reclining Buddha, its official name is Wat Phra Chettuphon Wimon Mangkhlaram Ratchaworamahawihan (Thai: วัดพระเชตุพนวิมลมังคลารามราชวรมหาวิหาร;IPA: [wát pʰráʔ tɕʰêttupʰon wíʔmon maŋkʰlaːraːm râːttɕʰawɔːráʔmahǎːwíʔhǎːn]). Hope you remember that name! 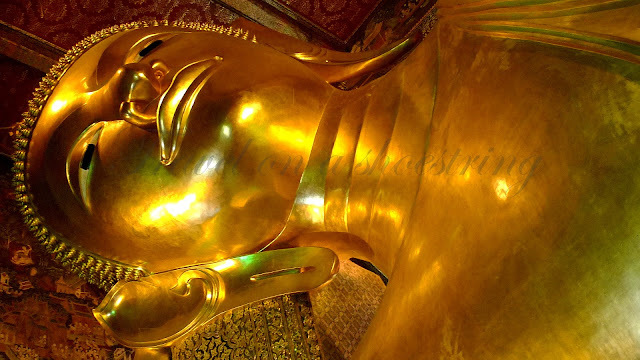 The Buddha statue at Wat Pho is reclining because he is at peace and has attained Nirvana (enlightenment). They said that he is awaiting for heaven in this pose that's why he was reclining. The beautiful back view of the giant reclining Buddha at Wat Po.